Activity Cycle: Diurnal. After dawn, emerge from nest burrows; perch, preen, and fly as clan groups to feed. Return in late afternoon to socialize and preen; enter burrows for night. to 1,000 nests in cliff faces. Diet: Consume many species of flying insects, especially bees and bee-predators. Predators: Monitor lizards rob nests. Humans kill birds for their feathers and because they believe these birds pose a threat to bee hives. follow gift to female from male. Thought to be monogamous. 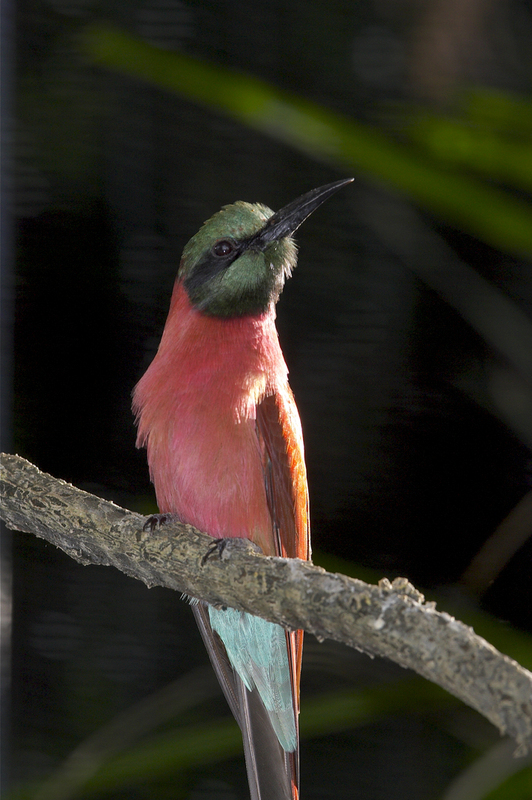 San Diego Zoo was the first North American zoo to breed Carmine and White-fronted Bee-eaters. © 2010-2018 San Diego Zoo Global. Updated March 2010. IUCN Status, Body Measurements, Threats to Survival updated Jun 2018.